So we are a week out from The Tough Ruck. The actual website is down or has problems, but the Facebook page is fine. So, go there, like it, and if you can, donate, attend, yada yada. "Tough Ruck, a 26.2 mile Ruck March, is a project of the Military Friends Foundation. We are proud partners with the Boston Athletic Association, National Park Service and The Trustees. On April 14, 2019 be part of something GREATER. Join the elite group of 1000 Tough Ruckers who will be the first to earn the official 2019 Boston Marathon Medal! So, I'm still processing the passing of my friend Carrie. I couldn't go to the funeral. Financially, flying to Kansas City from the East Coast was prohibitive and I've had a cold for six weeks. I can't talk without coughing/gagging and peeing my pants. But if i couldn't be there, at least I'm in a Carrie place. She attended Mary Baldwin College here in Staunton, VA and loved Wright's Dairy Rite down the street. So, I have that. The internet has given me sooooo much. But once in a while, it gives you a gut punch. When I started blogging, technically I was a #Milblogger. I had never served and I wasn't a spouse. I fell into the category of #supporter. And when #MilblogConferences started happening, I went for the parties. And I met a ton of cool people. Some of them are and will continue to be my life long friends. One of the very best was Carrie Costantini. Carrie was a "doer". I wrote stuff, I followed other people's lead when i could. Carrie got stuff done. Not in a big showy way. In exactly the right way. One of the things Carrie and I talked about was Staunton, Virginia. That's where my eldest son lives and Carrie went to Mary Baldwin College. One of her first questions was had I gone to "Wright's Dairy Rite". 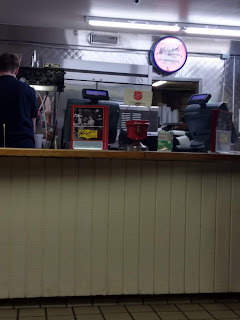 It's a burger joint, like an old fashioned car hop/drive-in place. A working juke box. They opened it in 1952 and around these parts, it's local legend. I'm about 50 or so hours past my latest Dara infusion. I haven't written about it (or much of anything), but it's a biologic and your body tries to fight it. My body mimics a really bad head cold. So my ears, nose, and chest are stuffed up. When the other half of #TeamM called to tell me that Carrie had passed away today, I tried to pretend my stuffed head got it wrong.. So I got up and took a shower and went and got a burger and onion rings. Here's to you Carrie.